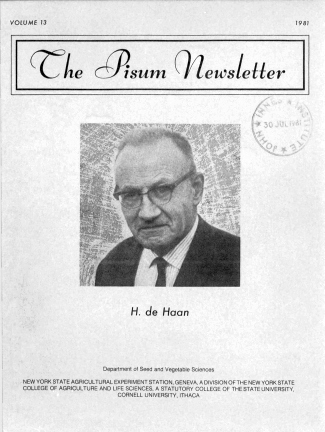 The cover photo of Dr. DeHaan was taken in 1965 when I was inEurope on a sabbatical leave. The photo was taken in the glasshouseusing 35 mm color film. Our own professional photographer, Mr. ParisTrail, converted the photo to black and white so that we could featureit on the cover. DeHaan's few but significant and lasting papers mark him as animportant early contributor to pea genetics and one deserving of our recognition. ANTHOCYANIC LEVELS IN PISUM FLOWERS. POLLEN PIGMENTATION AND THE ACTION OF MUTANT yp. A CO-FACTOR DISTURBED NITRATE REDUCTASE DEFICIENT MUTANT. TWO NEW DOUBLE MUTANTS OF PISUM. DERIVED FROM THE STRONGLY FASCIATED MUTANT 489C. A PISUM GENE CONTROLLING RESPONSE TO PHOTOPERIOD. THE BEHAVIOR OF A "MICROMUTANT" IN THE PHYTOTRON. IMMUNITY TO PEA SEEDBORNE MOSAIC VIRUS: A REASSESSMENT. APPLIED AUXIN IN PEA SEEDLINGS. APPLICATION OF AUXIN TO ROOTS OF PEA SEEDLINGS. FASCIATION AND HETEROSIS IN PEA (II). ADDITIONAL DATA FOR THE St-Bulf-Chi-6 LINKAGE. A CHLOROPHYLL MUTANT WITH TWO SITES OF EXPRESSION . THE LINKAGE RELATIONS OF A NEWLY ISOLATED nana MUTANT. ARTHRITIC (art): A NEW GENE ON CHROMOSOME 6. THE LIKELY FLOWERING GENOTYPE FOR SEVERAL CULTIVARS AND MUTANTS. WITH REFERENCE TO ITS TAXONOMY. GENOTYPIC VARIATION IN THE FLOWER DELAYING EFFECT OF ETHEPHON. PRODUCTION, UTILIZATION, AND MARKETING OF FIELD PEAS. PROTEIN CONTENT AND SEED YIELD. CONTENT BY THE HALF-SEED TECHNIC. GROWN FROM 'WHOLE SEEDS AND PROM HALF SEEDS. NITRATE REDUCTASE-DEFICIENT MUTANTS IN PISUM SATIVUM.